“In late July 1974, Hancock interrupted his busy touring schedule with The Head Hunters Band to record a solo album for CBS/Sony in Japan, something he had never done before. The only other time he had attempted a solo performance during a recording was an alternate take of “Goodbye To Childhood” from his Blue Note album Speak Like A Child (1968). And even live, Hancock had seldom dabbled in solo performances. A noteworthy exception was a controversially received electronic solo concert at the Newport Jazz Festival exactly one month before the recording of Dedication, alongside acoustic solo performances by Keith Jarrett and McCoy Tyner. 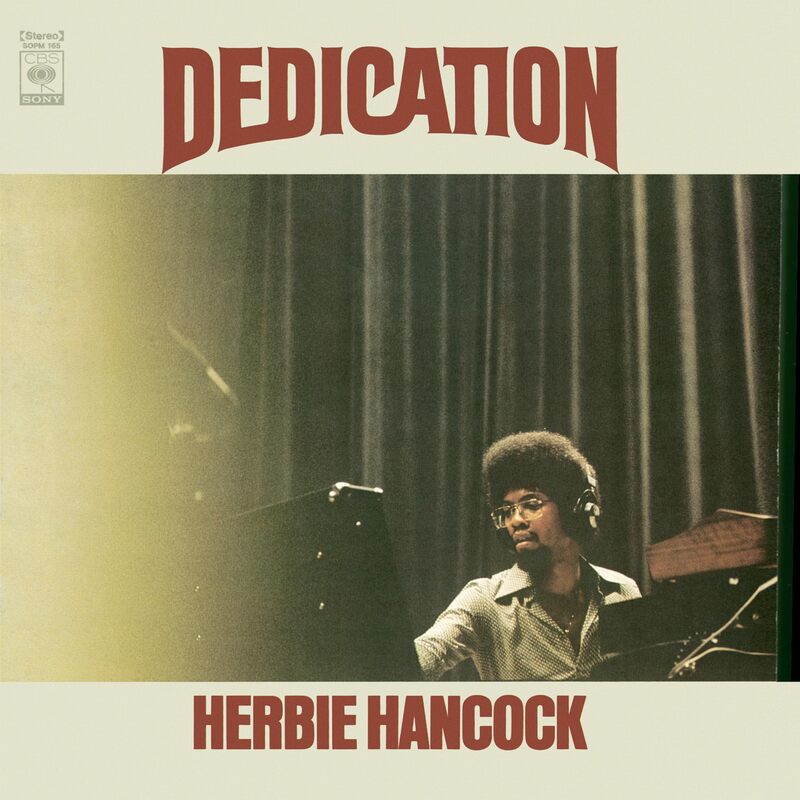 On the first side of Dedication, Hancock restricts himself to the grand piano for renditions of his classics “Maiden Voyage” and “Dolphin Dance” (both of which first appeared on the Blue Note album Maiden Voyage in 1965). The second side of the album is drenched in electronic textures and soundscapes. “Nobu,” a song Hancock dedicated to a close Buddhist friend, Nobu Urushiyama, is underpinned by a loop reminiscent of Sextant’s “Rain Dance,” while Hancock’s solo on “Cantaloupe Island” is superimposed over the bass line of an ARP Odyssey synthesizer. Herbie’s contract with Columbia was structured specifically to allow him artistic and creative freedom. He could deliver various projects which were ostensibly not “commercial,” and thus was afforded wide artistic freedom for an artist with an exclusive obligation to a single company. In Japan, Columbia/CBS Records partnered with Sony to form CBS/Sony. The people at Sony Japan had been long-time jazz fans and Herbie aficionados, and they proposed various recording projects, conceived strictly for the Japanese market. – The version of “Maiden Voyage” on this album is one of seven different versions Herbie recorded for Columbia. For other versions, see Flood, V.S.O.P., Tempest In The Colosseum, An Evening With Herbie Hancock & Chick Corea In Concert, Kimiko Kasai w/ Herbie Hancock: Butterfly, and Perfect Machine. – Another version of “Dolphin Dance” appears on the album Herbie Hancock Trio With Ron Carter + Tony Williams. – Another version of “Cantaloupe Island” appears on the album Secrets. ARP PE-IV String Ensemble – A polyphonic synthesizer designed as a multi-orchestral machine to reproduce the experience of listening to a full string orchestra. Herbie played this instrument on Dedication. Shure Reverberation Mixer – This is a mixer you would see with any standard PA system. It allows for multiple instruments or microphones to be plugged into the unit, and the ability to control reverb, volume and more in the sound produced. Herbie used this mixer on Dedication.